Last week, we outlined the deep roots of commonplace. The system of recording anecdotes, ideas, quotes, and reading has been an important method of observational learning that has withstood the test of time. Here is how you can take the basic concepts of commonplace and build them into Evernote. Commonplace is an ideal medium for the curation and cultivation of intellectual ideas, thoughts, and knowledge. It’s also a proven and timeless system, tested by folks from a spectrum of backgrounds including authors, professors, and scientists. Remember things. Evernote is already built to remember everything. Commonplace provides a foundation and a unique place to support lifelong memories as they relate to your personal and professional growth. With Evernote, all of the content is remarkably easy to find when you need it. Write to recall. Research has shown that writing things down benefits deeper processing of information. Whether by quill or by pen, if some of our greatest minds wrote it down, so can you. Simply start by adding your ideas and thoughts to a Moleskine Notebook. Understand reading. Commonplacing may sound and look a lot like a diary or journal. But, it’s so much more than that because it adds a contextual layer by seamlessly connecting your reading with your thoughts. It creates an intellectual layer to your private ideas by backing them up and correlating to your real-world discoveries. Personal reference system. The earliest systems of commonplace were intended to be encyclopedic, encompassing things you learned over the course of weeks, months, and years. Nothing is more powerful than having access to your own personal book of knowledge anywhere you go. Filter ideas. 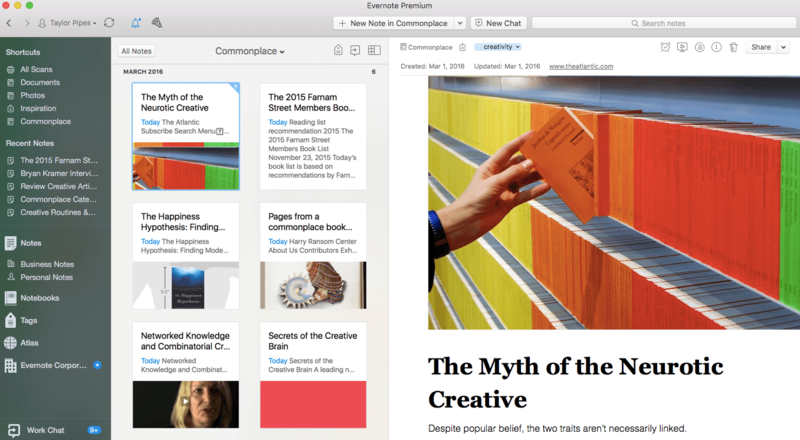 Evernote is built to filter and categorize different ideas. You can make the system as simple or complex as possible. Whether you rely on tags, notebook stacks, or shortcuts, all the information you capture to your commonplace is easily filtered and categorized where it needs to go. Unleash creativity. By incorporating a digital tool like Evernote (or, even an analog notebook system), you get the digital flexibility of adding to it purposefully, no matter where you are. That’s vital when you’re dealing with capturing creative sparks you discover throughout life. At their core, commonplace notebooks are fairly simple to execute. They don’t require a rigid system, just one that embraces fluid information capture and the ability to find content at your fingertips quickly. Early commonplace practitioners carried their notebooks everywhere. For digital and analog purposes, you can easily create a single commonplace notebook in Evernote and add to it anytime, anywhere. 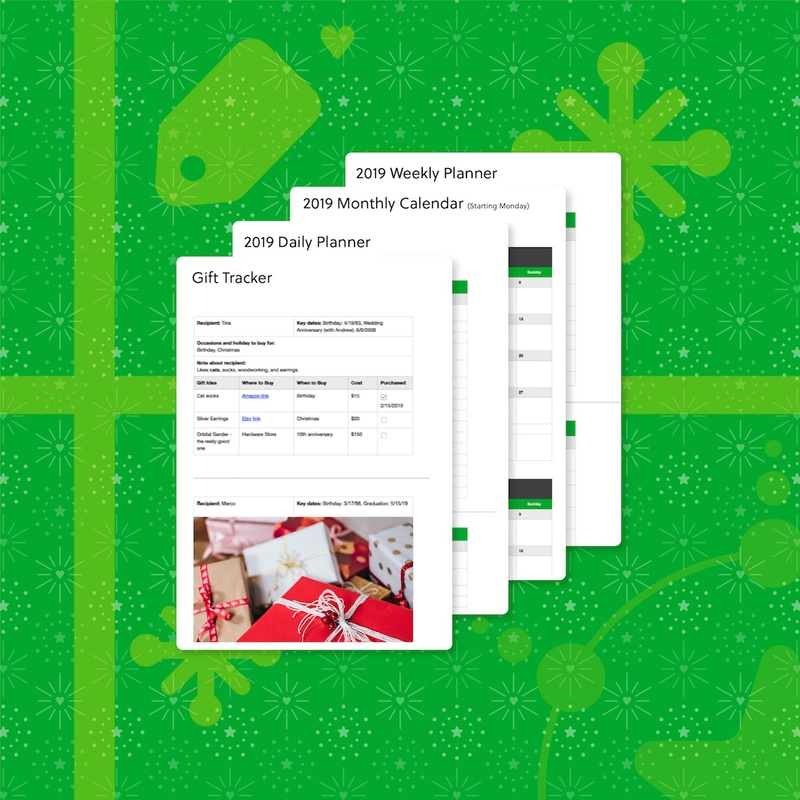 Download Evernote everywhere so that you can use it at on your desktop, laptop, mobile device (iOS and Android), and tablet. Evernote is supported by Moleskine Notebooks. If you do your writing elsewhere, easily capture that material into Evernote with Scannable or our document camera. The single notebook. Notebooks are a central place to store essential information you’ll run into like anecdotes, ideas, quotes, musings, observations, sequences, and titles—anything that is important and symbolic. It’s like an always-evolving magazine curated entirely by your interests. Create one notebook and add all your commonplace material as you go. You can rely on powerful search to discover content, or you can tag it to match the type of information you need. Power Tip: Surface the notes you need by sorting them according to their title (alphabetical), date created, date updated, or even filter from most recent to least recent. 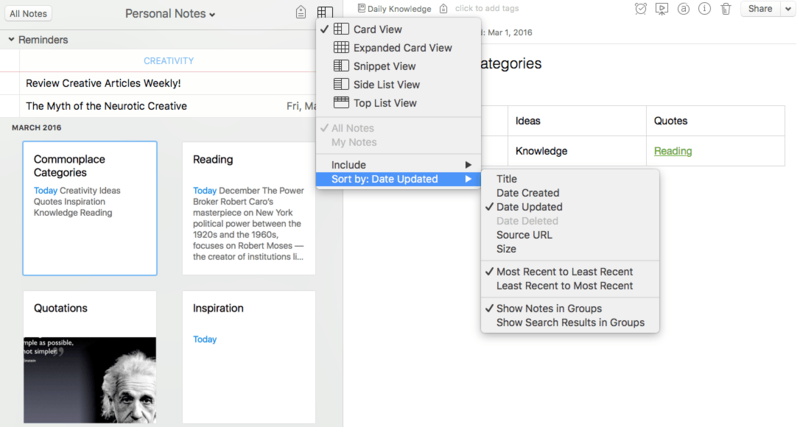 Learn more about sorting in Evernote. Stack it up. For some people, commonplace helps embrace a number of themes like creativity or inspiration. For others, it helps manage reading lists and annotations. By creating a commonplace stack, you can arrange a number of content buckets or themes together that fit under one master notebook. That way, you can dedicate efforts thematically. If you know you are on the hunt for a specific book, add it to your reading list notebook. If you just heard an amazing quote, add it to your quotation notebook. Power Tip: Create shortcuts to easily create and access notes based on the themes you need or the type of content you capture to Evernote. You can add shortcuts for notes, notebooks, tags, or stacks. Link to everything. 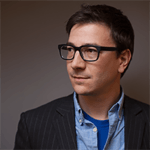 There may be no more perfect modern iteration of the commonplace than the rise of the blog and other curated views of the web. Through interlocking web links, one can cascade through a series of common themes and discover a world’s’ worth of information. You can recreate that in Evernote with note links — it’s a powerful tool to seamlessly tie together your commonplace themes. Evernote is an ideal medium for the curation and cultivation of intellectual ideas, thoughts, and knowledge. Nearly any type of content can be brought into Evernote, no matter where you are. That’s perfect for a system built on the spirit of capturing creativity and harnessing ideas. Observing the world around you. Some of our best ideas come to us when we’re not sitting at a desk. Rather, they happen when we’re out in the world, experiencing life. From photographs to audio notes and handwritten topics, anything you come into contact with is content that has the potential to make you a stronger student of life. You can bookmark, forward emails, take photos, record audio, add attachments to just about anything and it gets thrown into your “commonplace notebook” inside Evernote. What is even better is that you can easily tag things for multiple projects or ideas and link different notes together with associations. If writing and analog note-taking is more your speed, Evernote’s got you covered. You can take photos of pages or text and it is all OCR’d so you can easily discover it later. 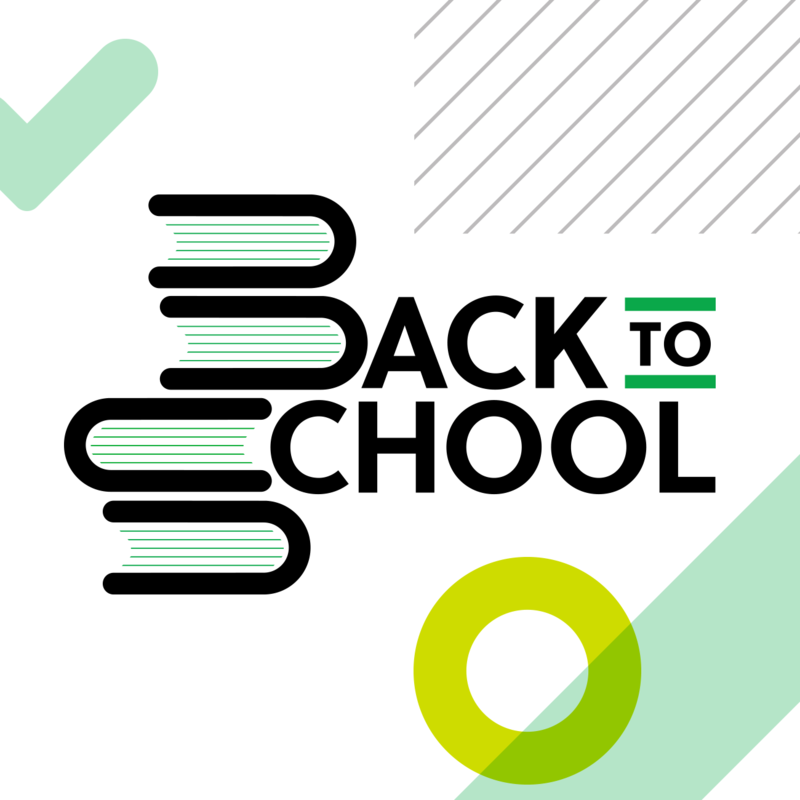 And, if that isn’t enough, we connect to and integrate with a host of applications and extensions that you can leverage to capture content, read material, and most importantly, to synthesize and understand for improved learning. Reading is the foundation that gives commonplace momentum. For the sake of commonplace, the material you want to save will be far different than the pleasure reading you take along to the beach. As Farnam Street explains, there are four different types of readers (a fascinating subject we will return to in a future “Taking Note” post), including skimmers and those who deeply analyze their reading. Each has a different goal. But, for the sake of commonplace, you’ll want to focus on analyzing and understanding your selections as a vehicle to learning. Capturing what you read. From Evernote extensions to third-party apps, there’s a ton of ways you can bring reading into your commonplace fold with Evernote. Web Clipper. From news articles to long-form essays, Clipper is the perfect way to capture the content you want to read. Clip now, read later, or easily organize the material for reference. You can also immediately organize the article into your commonplace notebook, add short remarks, tags, and even highlight important passages. 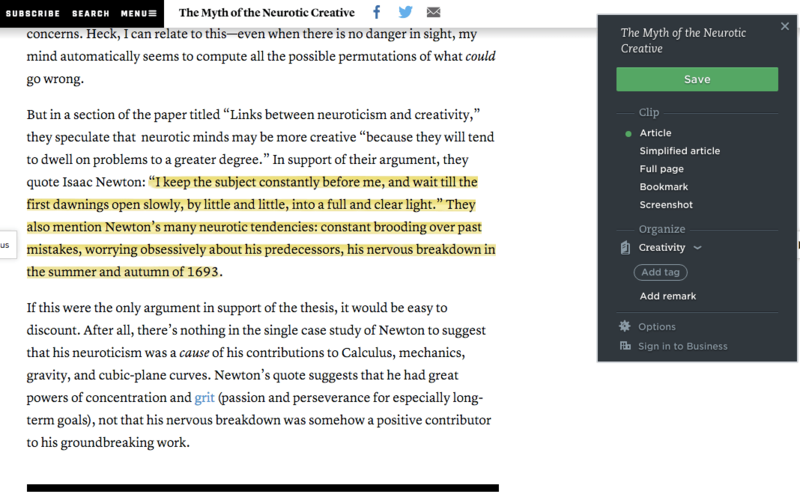 We clipped an article, “The Myth of the Neurotic Creative” and called attention to a passage about Sir Isaac Newton’s neurotic tendencies. 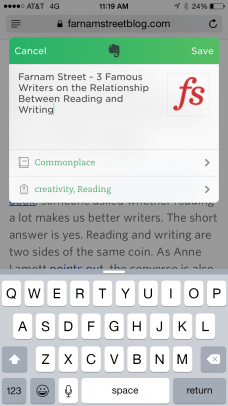 Power Tip: Now, you can clip articles you read on iOS and add tags to help you quickly categorize content. Learn more. Amazon Kindle. Capture and save your Kindle notes and highlights into Evernote in three simple steps. Learn more. Blinkist. Blinkist curates the world’s best business books and distills them into super manageable, easily readable 15-minute summaries presented both as text and audio versions in a mobile app for smartphones, tablets, and any web browser. 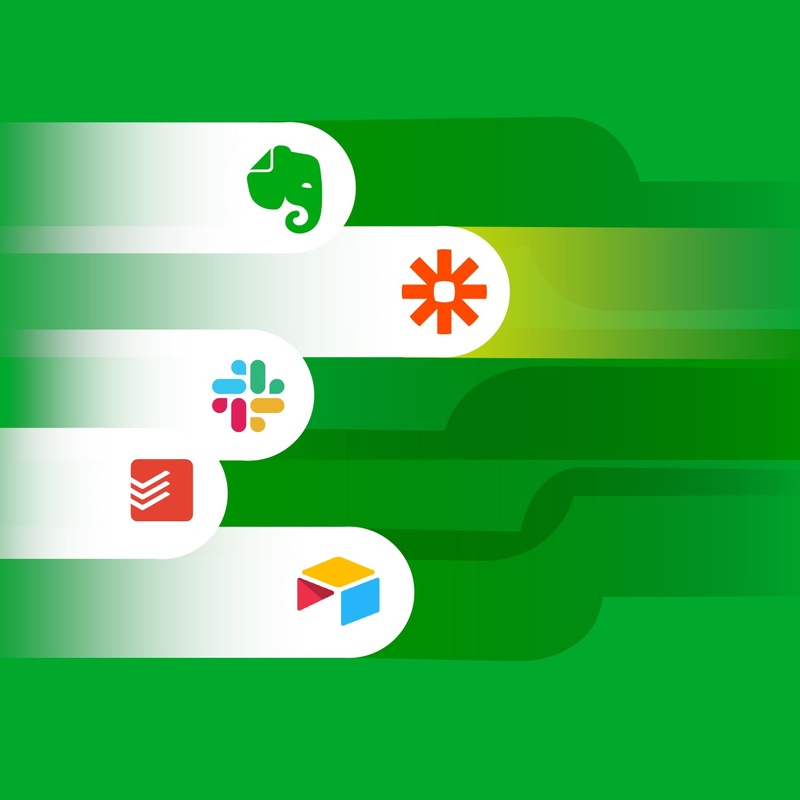 As you save highlights in Blinkist, they automatically sync to Evernote—all easily discoverable and searchable any time you need to access it. Learn more. Instapaper. With a single click, you can save the articles and reading you do on the Web. You can read anything you save with iOS, Android, and Kindle. Save your notes, comments, or highlights directly to Evernote with this IFTTT recipe. One of the components of commonplace was having access to essential highlights of things encountered in reading or daily life. Having an equivalent digital system is irreplaceable and a powerful addition to your Evernote. The most profound power of your commonplace is being able to thumb through reading and review material. Your commonplace book isn’t just a filing cabinet—it’s an evolving record of your life and observations. By recording and capturing so much, you can track your progress, reflect on what you have seen and read, gain fresh insights, and achieve clarity on what needs to be accomplished. If you need a prompt to review your commonplace, you can create a reminder in Evernote that will encourage you to take the time each week (or month) to review and remember what you’ve captured. That’s when the real value of commonplace shines through. How are you organizing your commonplace notebook in Evernote? Share your story and tips in the comments below.